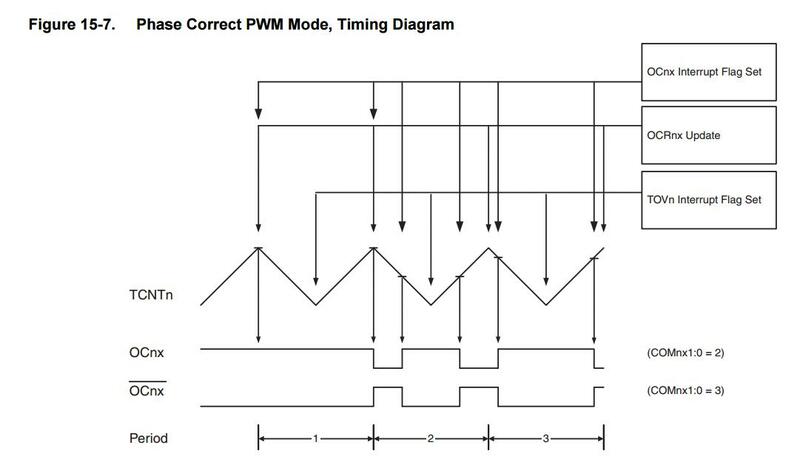 Fast PWM mode -timer count from a BOTTOM value to a TOP value after that it overflow to BOTTOM value and repeat(sawtooth waveform), it can generate higher frequencies(picture from atmega datasheet). For this mode the possible frequencies are given by the formula f=f_clk/N*256, where f is the neccesary frequency, f_clk is the oscillator frequency(16Mhz) and N is the prescaler(it has precise values and it is given form the timer’s bits so we will explain it in more details when we will talk about timers). 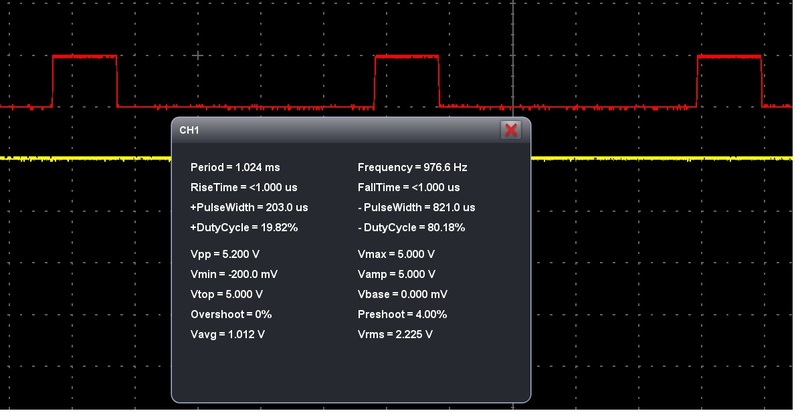 Phase correct PWM mode-timer count from a BOTTOM value to a TOP value after that it not overflow it countdown from TOP value to BOTTOM value and repeat(triangle wave). 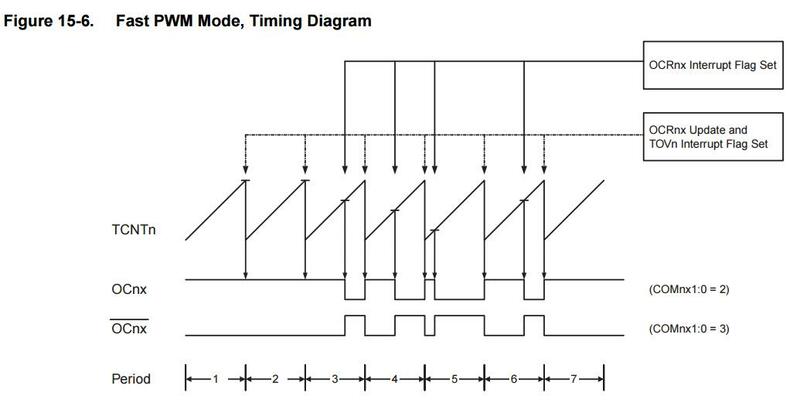 This mode has half of fast pwm mode frequency.It is preferred in motors control(picture from atmega datasheet). 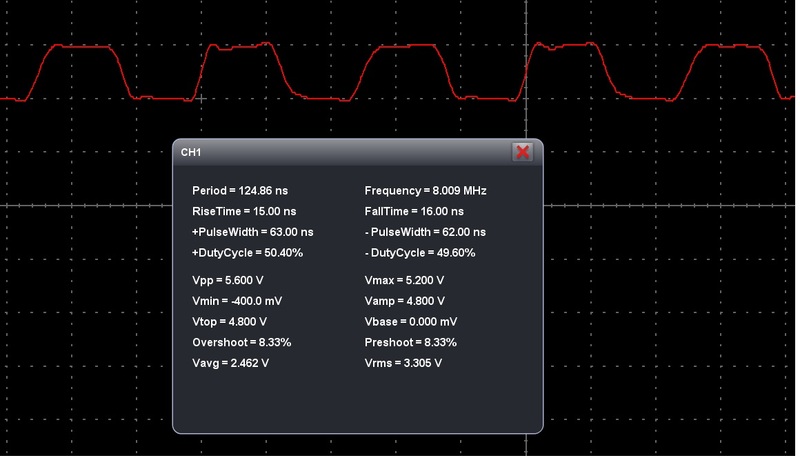 For this mode the possible frequencies are given by the formula f=f_clk/N*510, with all the variables like in the fast pwm mode. 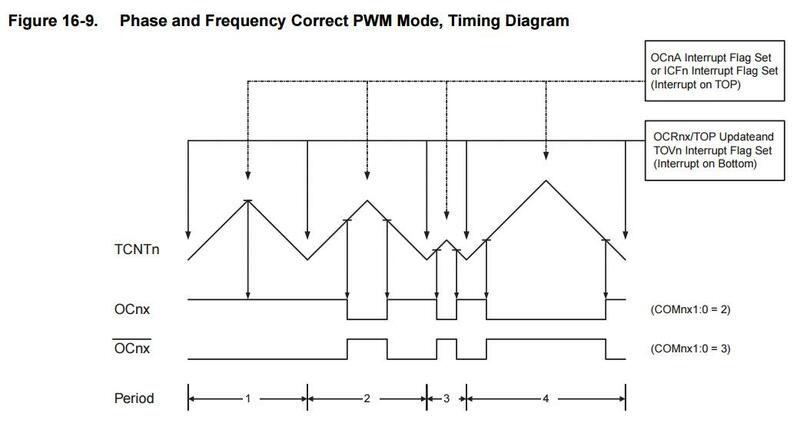 Frequency and phase correct pwm(only on timer 1)-are the same with phase correct pwm if the TOP value remains the same, if not let asumme that we have two TOP values TOP1 and TOP2, TOP1>TOP 2, when the timer count up to TOP 1 and down to BOTTOM the pulse have a specific time period but when the timer count up to TOP 2 and down to BOTTOM, because the TOP 2 is smaller than TOP 1 the pulse have a small time period so a higher frequency(picture from atmega datasheet). CTC mode-in this mode timer count to a TOP value and when it reach that value clear the timer and execute something. 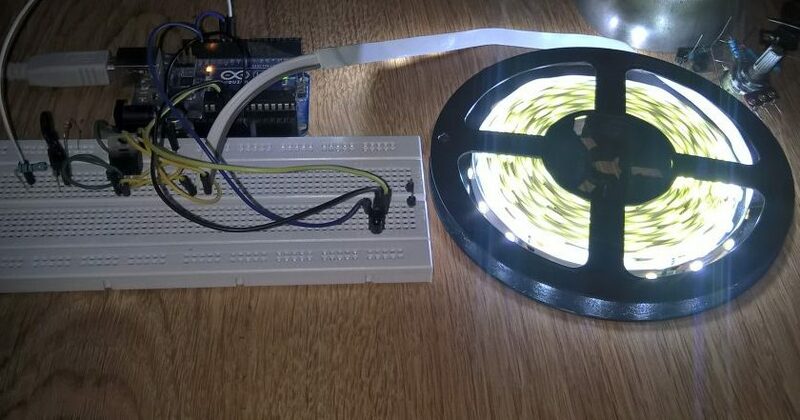 This mode let us to make very precise operation(picture from atmega datasheet). Now let’s talk about timers! 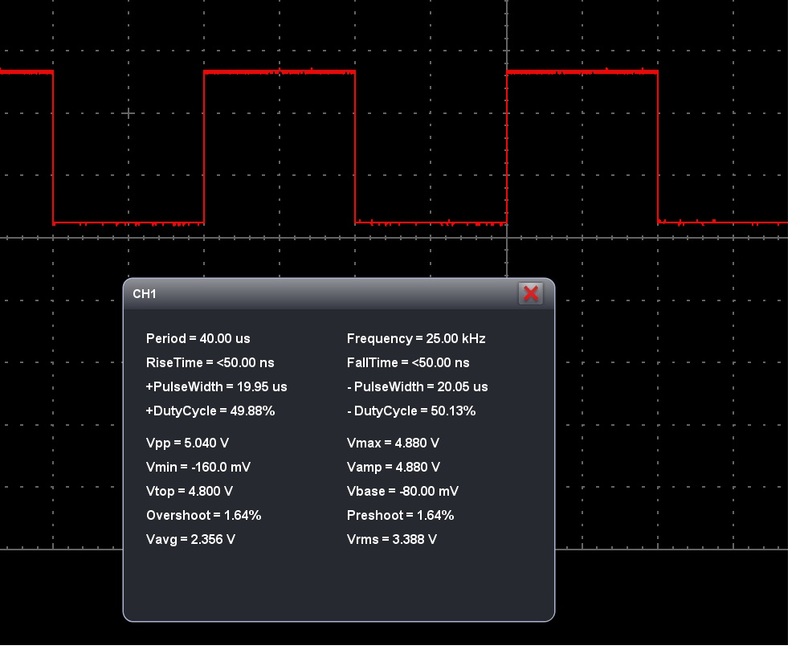 Timer 0 manage pins 5 and 6, so next in a couple of examples we will show you how to manage the pwm frequencies. 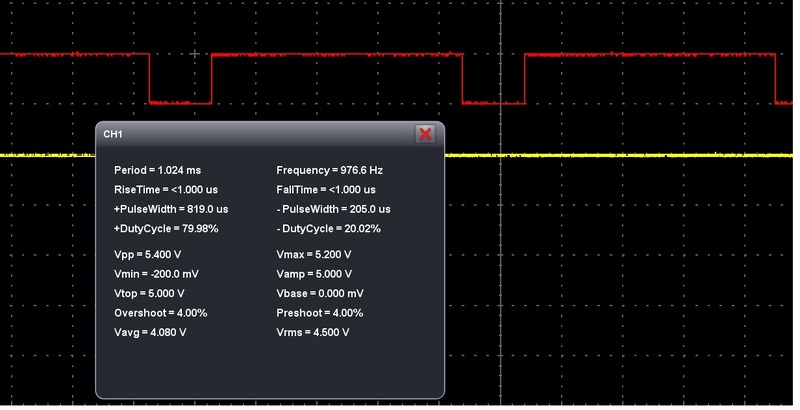 Let’s assume we want to generate a Fast PWM Mode with a duty cycle at 50% (we will explain when we reach at the OCRA register ). 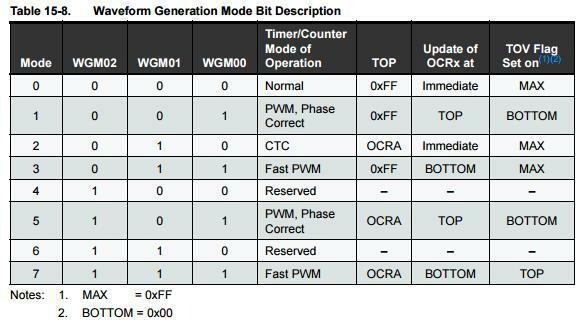 To choose the fast pwm mode in the TCCR0A we must make the WGM01 and WGM00 bits equals 1 like in the pictures below(from atmega datasheet). 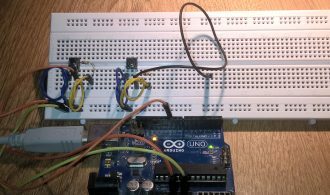 As we explained in this article in the arduino program we have TCCR0A=B10100011; this means that the WGM00 and WGM01 from the TCCR0A register are 1 which means that the pins 5 and 6 are in the fast pwm mode. But first bit and the third why are they 1??? These bits are COM0A1 and COM0B1 and in the images below you(from atmega datasheet) can see that they controls the pin 6(COM0A1) and 5(COM0B1). If we choose all bits(COM0A1 COM0A0,COM0B 1and COM0B0) 0 the pins are disconnected(they don’t work). 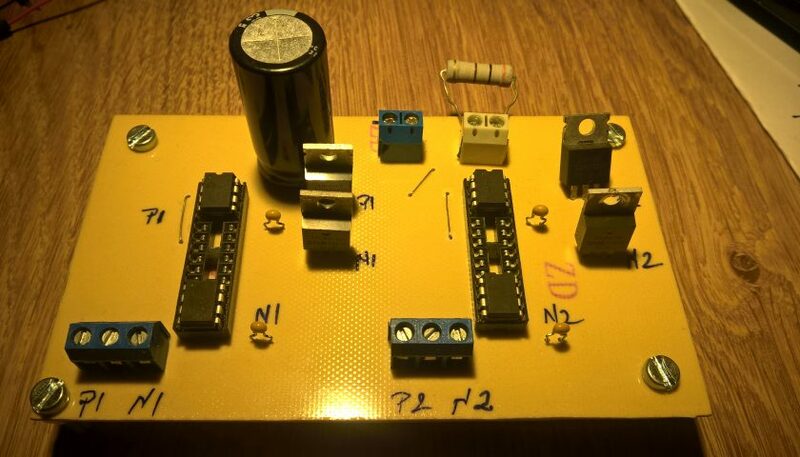 If you choose the COM0A1, COM0B1 1 and COM0A0, COM0B0 0 then pins 5 and 6 generate a PWM and with a prescaler let’s say 64(explain soon) from the formula f=f_clk/N*256 we will have a 976 Hz pwm signal. 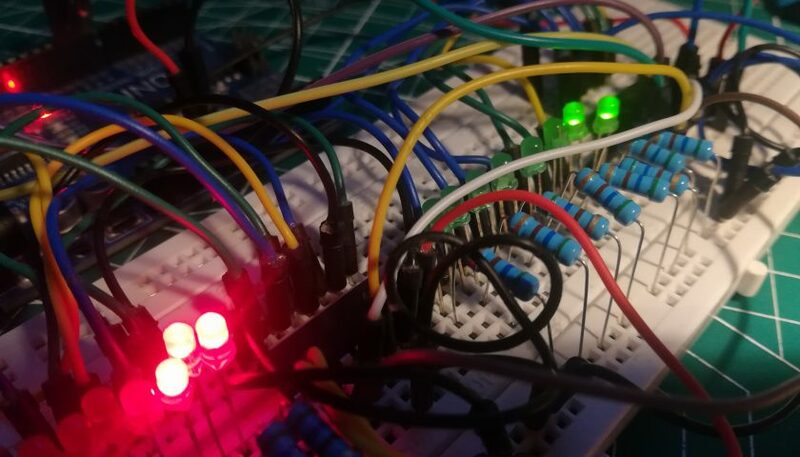 Now if you choose COM0A1 0 and COM0A0 1 and make the WGM02 bit from TCCR0B register 1, the pin 5 is disconnected and timer counts for pin 6 until it’s reach OCR0A not until 255(if OCR0A is not 255) which is maximum. Ok ok but what is the relation between OCR0A and frequency. Also from datasheet we have the formula (it is in CTC mode but it is avaible in here also) fOCR0A­­=fclk/2*N*(1+OCR0A). 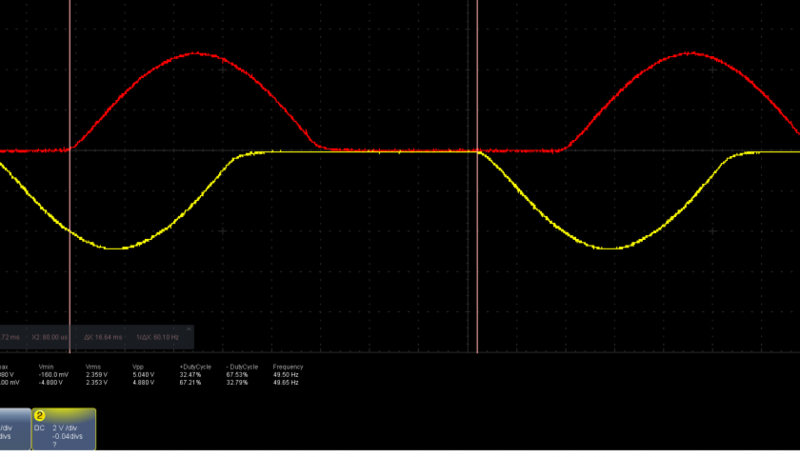 This mode has advantage that can reach very high frequencies but the disavantage is that you have a fix duty cycle. With the formula OCR0A ­­=(fclk/2*N*fOCR0A) -1 (first formula but rearranged) and this mode if you want a specified frequency you calculate the OCR0A and introduce it in the program. For example if you want a 25kHz (but is at 50% duty cycle) you must choose a OCR0A=39 and a prescaler=8, because if we don’t use prescaler the OCR0A from the formula give us OCR0A=319, and because timer 0 has 8bits the OCR0A <= 255. Finally we will talk about prescaler, OCR0A and OCR0B(which give the duty cycle). 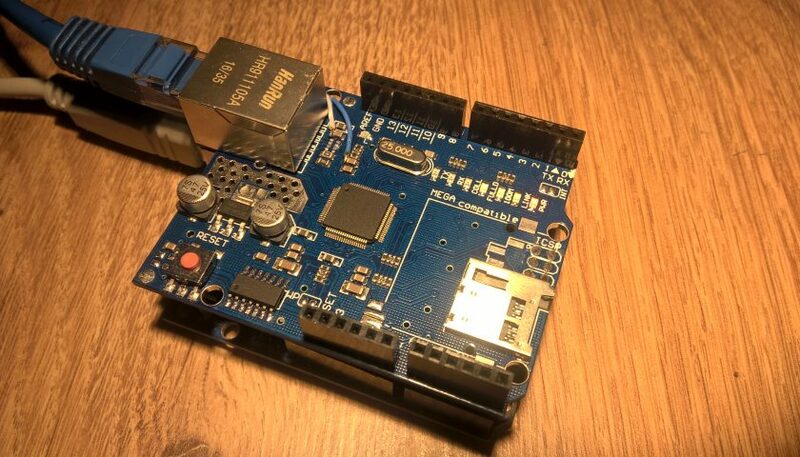 It is controlled by CS00, CS01 and CS02 bits with different combinations as you can see in the image above. 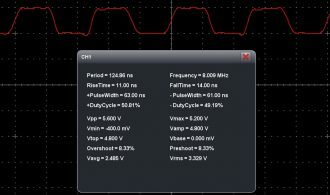 Which of programs you have try because each of them i have analized on the oscilloscope and work well??? 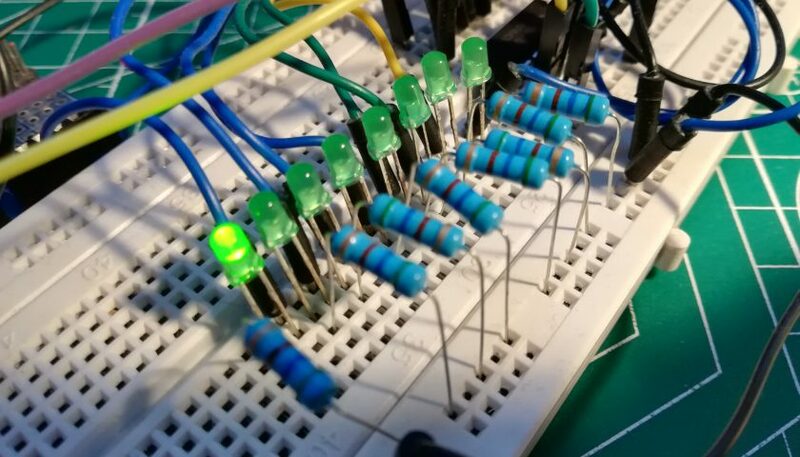 hello, thanks for this article this has helped me understand how the microcontroller works to produce the pwm signal I just had a question about the code. 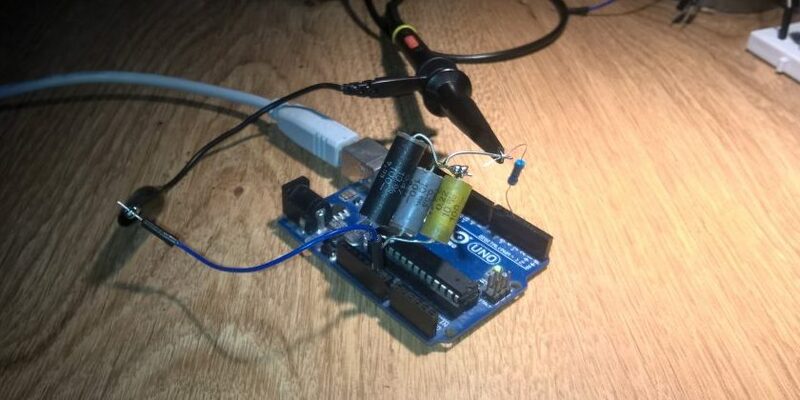 Is this code just used on a standard arduino uno and could it possibly be modified to work on a standalone atmega328 to produce a 40kHz pwm signal? If you don’t need the program right now i will write a post but in a few days(i don’t have free time right now). hello, Sir, I’m using Proteus but this code timer 0 is not working mean pin 5 and pin 6 is in silent mode but the code of timer2 is pin 9 and pin 10 is working fine please help me why? 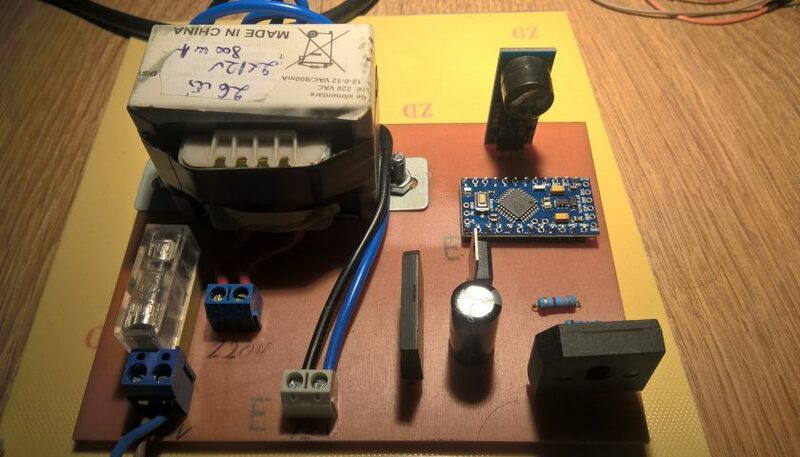 if u can please i need an automatic transfer switch for solar diesel power system with arduino base. I’m facing with a problem in one of my projects. 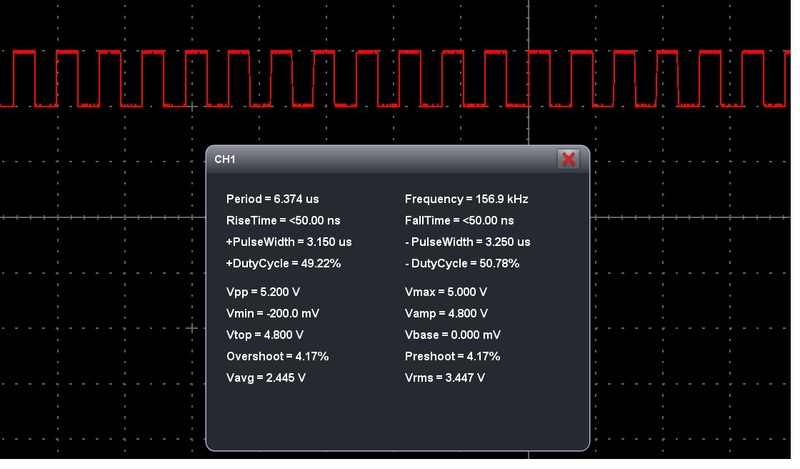 I’ve an Arduino Nano and a 4pin Fan and need to change the duty cycle of the 25khz singnal. Is that possible? At 25kHz from what i know it is not possible because the frequencies with variable duty cycle are calculated with formula f=16Mhz/(N*256) where N=1 or 8 or 64 or 256 and 1024.